Dane Swan is a Bermuda raised, Toronto based, internationally published poet, writer, and musician. These seven slices of urban life offer a poet turning his hand to fiction with masterful results. Swift, precise, unflinching but compassionate, Swan’s tales are bound together by his insight into the compromises we make to stay afloat, and the moments when we confront the deals we’ve made or betrayed. Into the ways we hurt, and the ways we heal. “With curiosity, gentleness and integrity, Swan reimagines the possibilities of a life, of many lives.” The Trillium Award jury’s praise for Swan’s poetry applies equally to his stories. 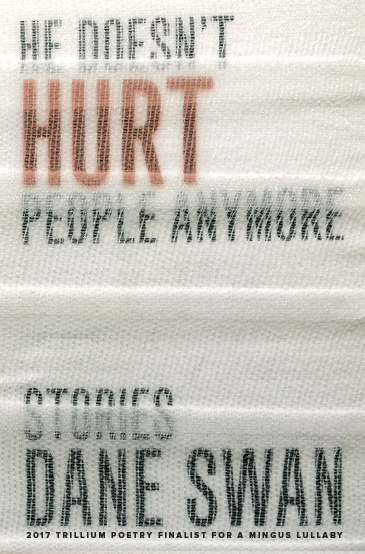 He Doesn’t Hurt People Anymore marks the arrival of a bold, confident voice to the Canadian fiction scene. A retired fighter finds consolation as he wraps the hands of the boxercise ladies at his gym. A classical musician resists an old Rasta’s advice to put a spell on his violin. The top performer at an employment agency mocks the failures who bring her their broken dreams. Victims of a psychological sadist turn the tables on their tormentor. Some of the people in Dane Swan’s portraits are wounded, trapped, and dangerous; some of them know you’ve got to keep moving so you don’t get hit. We see their fates illuminated in a flash and wish they could catch these glimpses too; the lucky ones do. All of them are vivid and real, animated by Swan’s uncanny gift for sparking an immediate sense of familiarity.